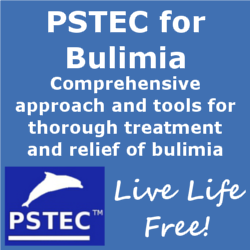 This audio is a large and comprehensive self help system for bulimia nervosa. It incorporates many other strategies as well as PSTEC and for this reason it’s an optional extra. Note: As a therapist Tim Phizackerley specialized in treating Bulimia Nervosa for a number of years. “Tim, I didn’t think hypnotherapy would be for me, but after one session it really REALLY made a difference to the way I think about and react to food. I know it has been less than 24 hours since I saw you but I simply had to contact you to inform you of how wonderful things are!! Yesterday was the first day in over five years that I was not sick. When I left yesterday I felt a bit indifferent, not sure whether it had ‘worked’ or what and when mum rang and said ‘are you cured then? I thaught, well I hope so, its dificult to say, I think maybe I am, but then wow, whilst driving home I noticed how I was thinking about things soooo differently. I stopped to get fuel and instead of my old thinking of what/how much food I could buy from the garage etc it didnt even cross my mind! I went home, felt hungry at around six so made a healthy tea, enjoyed and really tasted every mouthful and then that was it, forgot about it and decided I was off to the trafford centre late night shopping to treat ‘the new me’. I never really thaught about food for the rest of the evening until I got home and decided I was a little peckish so had some fruit and a hot choc before bed, its totally strange, I really can’t believe it, everything is different and so so much better. I feel great about my self, as you said, I feel confident and like I am ‘dazzling’!! I’m not quite sure what my boyfriend quite knew what to think when I got undressed for bed with the lights on rather than off, something I would never have done before but I thaught to myself, I have a nice body and why hide it! Similar thaughts must of being going through my head when I baught a brand new and rather revealing dress shopping last night, I thaught to myself, ‘I can wear that, why not’! I seem to be more motivated with everything, when my alarm went off this morning, instead of my old thinking of ‘I really dont want to get up, I am not ready to face the day, I simply thaught ‘oh better get up, things I want to do and want to make a start, I felt refreshed and alive and in years I have never felt like that!! As Tim’s’ ability to correct bulimia had become more and more well known his prices rose substantially. For this reason and in order to make sure that nobody was “priced out” Tim created a complete self help audio system for correcting bulimia nervosa. It’s that system that’s available here. It’s a large system comprising several hours of audio. It can be used for self help or if you happen to be a therapist, you can study it for use as the basis of an effective one to one therapy. The very successful American hypnotherapist Kaben Starre, who works fairly close to Hollywood has taken an interest in Tim’s work and in the methods he has have developed. Sincere thanks to Kaben for having conducted things so thoroughly and also for having the requisite skills to use the techniques. Here is the feedback he gave regarding Tim’s method for clearing bulimia. I’m writing to say how well your audio program worked. As a hypnotherapist for the past 29 years I have tried to help a number of people with Bulimia and have had zero success. This is inconvenient since half my clientele are in the movie industry. Many have needed help with these eating disorders. They need it to be done with strict confidentiality and that is not very likely where there are large staffs at in-patient treatment centers. As you know, I did everything I could to get out of treating this client, because of my past failures with Bulimics, and even tried to talk her family into my flying her over the pond to be helped by you at my expense. Since this well known family would not allow it, for fear of a scandal, I reluctantly took on the task armed with your audio program and your advise. I invested a week studying and memorizing and rehearsing all of your phrases and your delivery. Over a two day period client and I worked through everything while following your audio program closely. We finished the program and she was off to her home in Manhattan and her best friend’s birthday party later that week. I was concerned about the party because everyone binges at a party… don’t they? Remember now that this girl has had been in bulimia hell for ten years and has been to two rehabilitation centers where she received traditional medication with cognitive behavior therapies; both for six week in-patient programs. Not only did both fail to help my client but they actually made her worse off because they made her absolutely convinced that she could not be helped. They also charged more than $30,000 at each clinic! She said she did multiple purges the very days she left both centers. Tim, your program has had nine days of success after only two days of treatment! I spoke with her just today and she is positive that her binge/purge compulsions are gone forever. Her family is delighted, she is amazed and I am more so. The brilliant effort you have made to put your expertise and wisdom into this truly effective program is obvious. I am not surprised that it is so effective since you are clearly Britain’s authority on these conditions. What I am surprised at, however, is the compounding effectiveness that each module builds in the user while at the same time being so easy to use. Just load the modules into an MP3 and go from one to the next module and do exactly as instructed. Repeat any module you need to! Why people are going through life in bulimia/Anorexia Hell or still going to the traditional, complete-failure treatment centers to get help when you and this program are right there is what surprises me more than anything, I suppose. Thank you soooooo much for giving me access to it. Kaben is based quite close to LA and Las Vegas and anyone in the USA wishing to benefit from the “Phizackerley Method” of clearing bulimia may wish to consider contacting him. The processes Tim uses are designed to systematically dismantle the framework that exists below conscious awareness and which constitutes bulimia nervosa. This audio system is several hours long and as such it’s approaching 100mb in size. You will need broadband to download it.